The medium-sized and white colored catfish with red eyes is indeed attractive and appeals to every fish lovers. They only grow up to 3 inches in length and similar like any other catfish in its family, has barbels near the mouth region. One of their defining characteristics is that they love to school and in order to ensure that your Albino Corydoras Catfish is living happily in your community aquarium, you must get at least 5 to 6 numbers of this fish for companionship. They also love to hide and it is a good idea to place objects like driftwood and decorative cave for them to play around. Caring for the species is not difficult and as long as you fulfill their requirements like providing clean water condition coupled with nutritious food, they will thrive well even in small community tank of less than 20 gallon. The pH level of your water should be around 6.5 to 7.5 and moderately warm water of around 26 –28 degree Celsius is fine for them. Adding some aquarium salt is also recommended because basically it can serve as a tonic and disease prevention for the fish. Other than the basic requirements above, albino corydoras will also do best in high oxygen waters since they are basically bottom dwellers. An undergravel filter system that serves to provide clean water and at the same time ensuring that the whole tank is properly aerated will be the best set up for your pet. Since they also stir up the debris and then munching through the leftover food, corydoras catfish will be perfect for your community tank that demands high water quality. Suitable tankmates for them can be just about any other community fish like neon tetra, hatchet fish, platy, pencilfish, swordtail and they can even be mixed with angelfish and dwarf gourami. When it comes to feeding, your pet will accept just about anything. One of the best food for albino corydoras catfish should be medium sized sinking pellets made-up of high quality ingredient. From time to time, you can also add variety to their diet like providing shrimps and bloodworms as extra supplement. Algae wafers will do fine for them as well and the only condition attached is never to overfeed your fish. 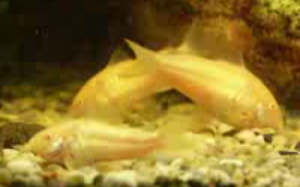 Albino corydoras will spawn on their own accord without needing your intervention. Active spawning activity will usually resulted in eggs deposited all over the aquarium especially at plant leaves. It will be scattered everywhere and once you notice tiny white opaque eggs, you should immediately remove the parents to prevent them from devouring the eggs. The fry will start to hatch in about 2 to 3 days depending on the water temperature. It might help to make the process become faster if you increase the temperature using aquarium heater and maintain close to 29 degree Celsius all throughout the period. Once they hatch, you should leave them for about a day to settle before offering them supply of live microworms or brine shrimp. In about a month or so, they will start to take appearance of adult corydoras catfish and the next live cycle begins. If you can’t care for so many of them, I would suggest you give them out to friends who are fish hobbyist rather than dumping them into ponds.